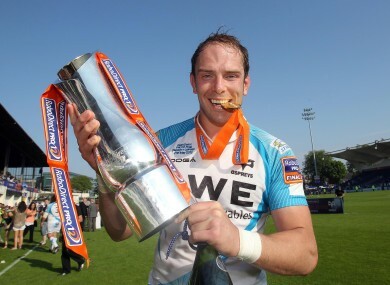 Ospreys captain Alun-Wyn Jones celebrates in May. THE IMMEDIATE OPERATING future of Ospreys rugby club has been resolved after the Welsh club came to a payment agreement with Her Majesty’s Revenue and Customs over an outstanding tax bill. The RaboDirect Pro12 champions were hit with the payment demands from HMRC the on 28 May, the day after they clinched the title by defeating Leinster at the RDS. The talented Ospreys squad contains numerous Welsh internationals, such as Adam and Ryan Jones, and last season bade farewell to the country’s all-time leading try-scorer Shane Williams. We can confirm that on the request of HMRC, the petition against Ospreys Rugby Limited has been dismissed at the High Court of London today. ESPN-Scrum reports that Ospreys’ latest published financial accounts show the region made a loss of £1.46m in the financial year ending 31 May, 2011. The report adds that Cardiff Blues made an operating loss of £2.3m last year. Ireland international Tommy Bowe was on the books at Ospreys last season but has returned to his native Ulster for a 2012/13 season that begins on 31 August. Email “Don't sell the silverware: Ospreys avoid winding up order”. Feedback on “Don't sell the silverware: Ospreys avoid winding up order”.